The lovely Madame Gilflurt has invited me to take part in this 'Meet My Character' blog survey, whereby you answer 7 simple questions about the main character of your work in progress, and post this on your blog (tagging other writers to do the same if possible). I feel honoured to be able to share this, and my contribution can be found below. Although I have not tagged any other writers, I’d be very interested to hear about your individual stories, so do get in touch. I actually have two main characters in my novel: Eleanor Eden, later the Countess of Buckinghamshire from June 1799, and Elizabeth Williams, the ostensible daughter of a servant in Mr. Pitt’s household. Both women were real people who lived in the late 18th and early 19th centuries. Although these two women never personally knew one another, and came from opposites ends of the social class spectrum, they were united by their common connection to William Pitt the younger. 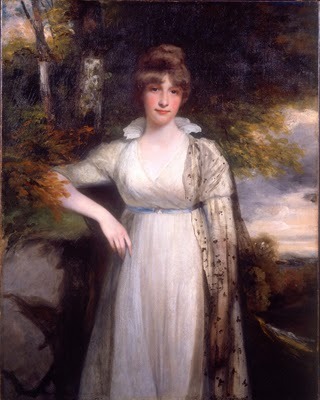 As there are no known portraits or engravings of Elizabeth Williams, I've only provided an image of Eleanor Eden by the portrait artist John Hoppner. It is set in England during the Napoleonic Wars, and spans the years 1793-1806. When the novel opens, it is September 1793, and Mr. Pitt has begun staying regularly at Lord Auckland’s estate known as Eden Farm. Eleanor Agnes is Auckland’s 16 year old eldest daughter, and has fallen in love with Pitt. Their mutual affection blossoms over the coming years, culminating in a declaration of love over Christmas 1796, and New Year 1797. Pitt, however, is not only immured in exorbitant financial debts, but his past hides a secret which ultimately drives them apart. My other protagonist, Elizabeth Williams, is a young girl growing up under Mr. Pitt’s care. Elizabeth and her younger sister Louisa Jane are educated and completely provided for by Pitt through various intermediaries, although they do not see Pitt often whilst they are growing up. Eleanor is the daughter of a British peer who was a close political and personal acquaintance of the Prime Minister (Mr. Pitt). Pitt lives at Hollwood, within a few short miles of Auckland’s Eden Farm. Pitt spends much of his leisure time - sometimes under the pretence of speaking about finances - at the Auckland estate. Although there is an age gap of 18 years, a reciprocated attachment of love and affection blossoms between Eleanor and Pitt. Meanwhile, Elizabeth is growing up, and beginning to realise that her and her sister Louisa are receiving a far greater education and preferential treatment than the average daughters of servants. Eleanor is in love with Mr. Pitt. Although Pitt reciprocates Eleanor’s feelings, he holds back. He realises that his political colleague Henry Dundas, and others in his cabinet, detest and distrust Lord Auckland. Pitt is also concerned about his financial inability to provide for Eleanor, although he has too much pride to openly reveal this to her. Most of all, there are ‘insurmountable obstacles’ barring the marriage, and Pitt never wants this information to be made known to the public. Fearing political as well as personal jobbery, and above all irreparable damage to his political standing, Pitt must decide if he can fully commit himself to Eleanor - or indeed to any woman. He has a powerful, almost unparalleled, sense of duty to his King and Country, and above all to the preservation of his Character. Elizabeth Williams is a servant’s daughter made good. At least, this is how she views her life until her mother becomes critically ill in late 1796. Fearing what will become of her two daughters, she begs Pitt to take them in and provide for them in the event of her death. By early January 1797, it is clear that Elizabeth and Louisa’s mother Jane is dying. The only question remains how long she will last. Forced by unforeseen events, Pitt must make a difficult decision - will he choose to marry Eleanor or provide for Elizabeth and her sister? At any cost, the secret he has to hide must never be made known. 5) What is the personal goal of the character(s)? Eleanor’s goal, and that of her intriguing father, is for her to marry William Pitt - the Prime Minister of England. Pitt is Eleanor’s first love, and she is very passionate about him. Elizabeth, meanwhile, is twelve years old, and is enjoying her life, and the fleeting amount of time she can spend in the company of Mr. Pitt. Although her and her sister do not see much of him, Mr. Pitt has always been very tender with the girls. He has always been very particular that they receive the best education possible - despite the fact that they are the daughters of one of his servants. When their mother Jane becomes dangerously ill, Elizabeth’s goal is to retain the protection of Mr. Pitt. The climax of the story comes in early January 1797 when Jane Williams’s life is determined to be nearly at an end. Suffering from a wasting sickness, the physicians apprise Pitt of her condition, and Jane begs Pitt to take care of her two young daughters. Pitt is suddenly forced to make a choice - marriage or duty. The working title for my novel is called Insurmountable Obstacles. If you’re interested to read more, feel free to get in touch. I’m actually working on two very different, but nonetheless interrelated, projects right now, so it may be several years before this novel sees publication! At the moment, I’ve been spending most of my time trawling through various archives and manuscripts in public record offices around the UK relating to William Pitt the younger and his contemporaries. My other project, which is currently taking precedence to my historical novel, is a non-fiction account of the private life of William Pitt as seen through the eyes of the people who personally knew him. Thanks for reading! I haven’t tagged any other authors, but if you’re interested (and have not done this already), I’d be very happy to read about your work in progress! Let me know what you think of Eleanor & Elizabeth! Thank you for sharing, Stephenie; I really can't wait to read more. Your passion and knowledge for Pitt and his world comes through in every word, the characters just live and breathe. I very much enjoyed this, and I learned some about Pitt from this. Thanks! Sounds very interesting, Stephenie. I love having contact with historians with a passion for a particular person. If I am ever stuck with detail for Pitt, I know where to come! Obviously your storyline has been inspired by facts. How do you keep what is fact and what is fiction separate in your mind? Thank you for your kind words, Rachel! I love your site. To answer your question about keeping fact from fiction, I attempt to remain as factual as possible in that the work is as closely linked with the events as possible. In the case of Elizabeth Williams, and her younger sister Louisa Jane, there is ample evidence in account books that William Pitt was providing for them during their upbringing. I say it so often, but the truth is sometimes stranger than fiction. In the absence of concrete 'proof,' I suppose we'll never know the girls true connection to Mr. Pitt.